The Boston Red Sox and St. Louis Cardinals tied for the best record in baseball in the regular season. Each team led its league in runs, with solid starting pitching and a dominant closer emerging midway through the season. But if you’re looking for a favorite in the World Series that begins at Fenway Park on Wednesday, it’s got to be the Red Sox _ by a whisker. Boston’s dugout is overflowing with facial hair these days, part of a bonding ritual that began when Jonny Gomes showed up scruffy at spring training. “It just sort of grew,” catcher David Ross said. To Ross, the beards are more than just the face of the franchise. “We find fun stuff to take up our time,” he said. “We all buy into what each other’s doing. 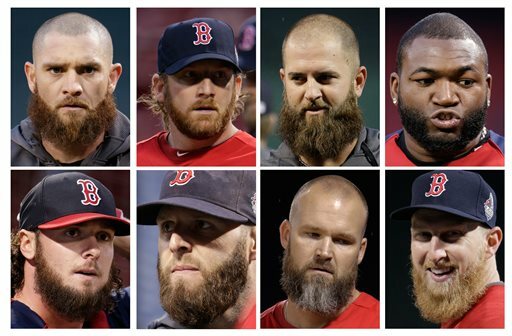 It says a lot about our team.” The beards are a bonding exercise for a couple of dozen guys who spend half of the six-month season traveling together, and the other half sitting around the clubhouse for hours, talking baseball. “It’s really a big love affair of teammates pulling for each other,” Carp said. The Cardinals have more than their share of unused razors, with the best beard on the NL champions belonging to injured pitcher Jason Motte. “I’m lazy. I don’t feel like shaving,” said Motte, who has had one since he was called up to the big leagues in 2008. Only slightly scruffy on the sides, it descends from his chin in two wide curls, like a waterfall going over a rock. More than half of the St. Louis players sport some sort of facial hair, but most of the beards are neatly trimmed. In this race, they concede defeat.